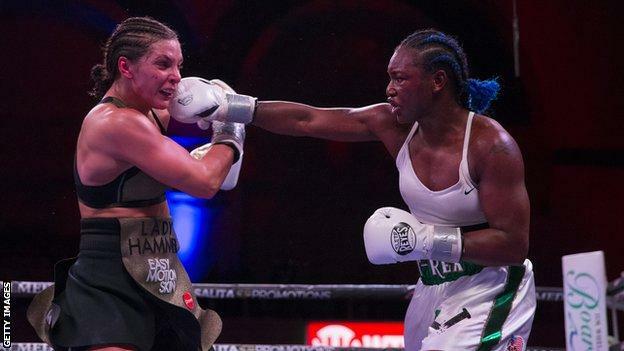 All three judges scored in favour of the 24-year-old 98-92 at Boardwalk Hall in Atlantic City.Her WBA, WBC and IBF belts and Hammer’s WBO belt were up for grabs in the bout.”I am the greatest woman of all time, give me that,” Shields, whose record moves to 9-0, said after the fight. Hammer, 28, had held the WBO middleweight title since October 2010.”You all told me I couldn’t do it,” said Shields, who won Olympic middleweight gold at London 2012 and Rio 2016.”Women’s boxing is on fire. I cannot wait to see the next super fight, whoever is in between.